The origin of the Grant family beyond their earliest records in America is unknown. Family history indicates that the Grant family came from Scotland, but the stories have not been based in any fact that anybody has been able to find. According to some, the Grant name is of Scottish origin, being a "commoner" form of "Grand" meaning, big, tall, elder or senior. William Grant was born circa 1670, probably in Scotland. He died in 1733 in King George Co., Virginia. Family legend indicates that William was a Catholic (Jacobite) and may have been involved in the Highland uprising in 1689 trying to put the Catholic King James II back on the throne of England. Apparently, William was at first sentenced to be hung, but his sentence was commuted to banishment to Virginia. Whatever the exact truth is, William had settled in Virginia by the 1690's and settled permanently in King George County by the 1710's. William married, probably in the 1690's to a woman named Elizabeth. (She may have been Elizabeth Mott, daughter of George and Elizabeth Mott). William and Elizabeth had 5 known children: John, William, Daniel, Mary, and Margaret. They lived at Sittenbourne Parish in King George County. William and his wife Elizabeth were both dissenters of the Church of England and were both fined for not attending church. Sometime probably by the late 1710's, William's wife Elizabeth had died. Then in the late 1710's or early 1720's, William was married to Margaret Glendenning (she may have been a relative of his first wife). They eventually moved from Sittenbourne Parish to Hanover Parish in King George County. William and Margaret had 2 known children: James (see next generation), and Jane. William wrote his will in 1727 indicating that his wife had eloped from him and had abused him in some way. On January 1, 1733, William added a codicil to his will and died before February 5, 1733 when his will was proven. William's second wife Margaret appears to have survived him and may have remarried to Benjamin Palmer after his death. William married first to Elizabeth in about 1698 in Virginia. She was born circa 1680 in Virginia and died after 1714 in Virginia. 1 John Grant was born circa 1700. 2 William Grant was born circa 1702. 3 Daniel was born circa 1704. 4 Mary Grant was born circa 1706. 5 Margaret Grant was born circa 1708. William married second to Margaret Glendenning in about 1723 in King George Co., Virginia. She was born circa 1700 in Virginia and died after 1733. Margaret was the daughter of John Glendenning and Ann Mott. 2 Jane Grant was born circa 1727 in King George Co., Virginia. James Grant was born circa 1723 in King George County, Virginia. He died before April 1805, in Caswell Co., North Carolina. James must have had some kind of turbulent childhood. Apparently as a young child, James' mother Margaret left his father William. Considering that James was not mentioned in his father's will of 1727, it is assumed that James went with his mother wherever she went. He eventually went to Stafford County, Virginia, where he married Ann Diskin, daughter of John and Elizabeth Diskin, in the late 1740's. They had 10 known children: Diskin (see next generation), James, John, Rachel, Elizabeth, Neely, Mary, Reuben, William, and Joshua. Sometime before the 1770's, James moved with his family to North Carolina where they settled at Caswell County. It was while living there that James served in the American Revolution. He served on the Committee on Safety in 1775 and 1776 and was a messenger and doorkeeper. James lived in Caswell Co., North Carolina, where he wrote his will on December 8, 1801. He died before April 1805, when his will was proven. His widow Ann died in 1808. James married Ann Diskin in about 1750 in Stafford Co., Virginia. She was born circa 1735 in Stafford Co., Virginia. She died before September 1808 in Caswell Co., North Carolina. Ann was the daughter of John Diskin and Elizabeth Clark. 2 James Grant was born circa 1755-1765 in Virginia. He married Elizabeth Powell. 3 John Grant was born circa 1766. He married Elizabeth Walker. 4 Rachel Grant was born circa 1776. She married John Tennason on February 3, 1796 in Caswell Co., North Carolina. 5 Joshua Grant was born circa 1779. Diskin Grant was born circa 1755 in Virginia. He died after 1825 in Montgomery Co., Tennessee. Diskin moved as a youth with his family to Caswell County, North Carolina. It seems that he later moved to Rockingham County, North Carolina. It was while living in North Carolina that Diskin served in the American Revolution. Sometime during the 1780's he was married to Susanna Robertson/Robinson and they later moved to Spartansburg District, South Carolina, by 1786. Diskin and Susanna had at least 4 children: Zachariah (see next generation), Joseph, James, and Joshua. Diskin lived in South Carolina until about 1798-1802 when he moved to Montgomery County, Tennessee. Diskin continued living in Montgomery County where he filed for a pension for his military service in the Revolutionary War on November 10, 1825. Afterwards there is nothing known of him and he probably died between then and 1830. His wife Susanna probably died during the 1820's. Diskin married Susanna Robertson before 1786 in Guilford Co., North Carolina. She was born circa 1766 in North Carolina. She died after 1820 in Montgomery Co., Tennessee. Susanna was the daughter of Zachariah Robertson and Elizabeth Tate. 2 Joseph M. Grant was born circa 1788 in Spartansburg District, South Carolina. 3 James Grant was born circa 1790 in Spartansburg District, South Carolina. 4 Joshua Grant was born on July 25, 1797. Zachariah Grant was born on October 18, 1786 in Spartansburg District, South Carolina 3. He died on September 13, 1864 in Montgomery Co., Tennessee 3. He is buried in the Old Grant's Chapel Cemetery, Montgomery Co., Tennessee. Zachariah was probably named after his maternal grandfather Zachariah Robinson. Zachariah was born and raised in Spartansburgh District (now County), South Carolina. As a child (sometime between 1799 and 1809) he moved with his family to Montgomery County, Tennessee, where they remained. While living there, Zachariah served in the War of 1812 as a lieutenant in the 1st Regiment of the West Tennessee Militia. Zachariah was married to Mary Wheless in 1810 and they settled on a farm in eastern Montgomery County, Tennessee, near the community of Port Royal. On their estate, they raised a family of eight children. Zachariah and his family were quite wealthy. In 1836, he owned 1500 acres in Montgomery County valued at $6,000. In the 1860 census, his total estate (personal and real) was valued at $100,300.00. He was also a slave owner (in 1860 was listed as owning 48 slaves - their value being a significant portion of his "wealth"). In adulthood, Zachariah was either a member of the Baptist or Methodist church. After the death of his wife in 1858, Zachariah lived with his grandson William Herring, who also served as his overseer. According to family history, Zachariah was murdered by a band of guerillas in a barn outside of his house on an evening that his grandson was away from home. Zachariah was married to Mary Wheless on December 27, 1810 in Montgomery Co., Tennessee 4. 1 Nancy Grant was born on September 12, 1811 in Montgomery Co., Tennessee 3. She died on April 2, 1874 in Montgomery Co., Tennessee 3. She is buried in the Old Grant's Chapel Cemetery, Montgomery Co., Tennessee. * Toni Cain Moody at Probanthia@aol.com is a researcher of this line. 2 David Grant was born on February 13, 1813 in Montgomery Co., Tennessee. He died on November 16, 1878 in Montgomery Co., Tennessee. He is buried in the Old Grant's Chapel Cemetery, Montgomery Co., Tennessee. He married second Telithia T. J. Hutchison on August 9, 1843 in Robertson Co., Tennessee. (She was born on July 16, 1824 in Tennessee and died on June 5, 1867 in Montgomery Co., Tennessee. She is buried in the Old Grant's Chapel Cemetery, Montgomery Co., Tennessee. A guess is that there may have been some kind of genetic problem that caused all 12 of David's children to die while relatively young. In 1880, his 30-year old daughter Emma indicated that she suffered from a spinal problem. 3 Martha Grant was born on October 2, 1814 in Montgomery Co., Tennessee 3. She died on November 9, 1852 in Montgomery Co., Tennessee 3. She is buried in the Old Grant's Chapel Cemetery, Montgomery Co., Tennessee. 4 Joseph M. Grant was born on about April 4, 1817 8 in Montgomery Co., Tennessee. He died on March 19, 1892 8 in Montgomery Co., Tennessee. He is buried in the Old Grant's Chapel Cemetery, Montgomery Co., Tennessee. 6 Elizabeth Grant was born on May 3, 1822 in Montgomery Co., Tennessee 3. She died on May 1, 1840 in Montgomery Co., Tennessee 3. She is buried in the Old Grant's Chapel Cemetery, Montgomery Co., Tennessee. They had no children, or at least none that survived. She was only married for one year. 7 Aquilla Grant was born on October 9, 1824 in Montgomery Co., Tennessee 5,8. He died on October 16, 1888 in Montgomery Co., Tennessee 5,8. He is buried in the Old Grant's Chapel Cemetery, Montgomery Co., Tennessee. 8 "Lottie" Charlotte Grant was born in June 1826 in Montgomery Co., Tennessee. She died on December 26, 1900 in Ferguson Station, Logan Co., Kentucky. She is buried in the Ferguson Graveyard, Logan Co., Kentucky. Many sources have confused her with a different Charlotte Grant of Montgomery County, Tennessee. That other Charlotte was born circa 1813, married John Cooksey, and settled in Missouri. Charlotte Grant Cooksey was not the daughter of Zachariah and Mary Grant, but was probably the niece of Zachariah Grant. Mary Grant was born on August 6, 1820 in Montgomery County, Tennessee 1,2. She died on March 16, 1870 in Montgomery Co., Tennessee 2,8. She is buried in the Sango Cemetery, Montgomery Co., Tennessee. Mary spent her youth at her parents' estate in eastern Montgomery County, Tennessee, near Port Royal. In 1840, at the age of 20, she was married to an aspiring young plantation owner named George Halliburton. They settled on a farm east of Clarksville in Montgomery County, where the community of Sango would eventually spring up from around their home. 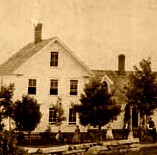 Besides the work involved with raising seven children, Mary probably helped with the administration of the family's successful farm and general store at their home. There is evidence that Mary may have been raised as a Baptist, yet as an adult she became a Presbyterian. She and at least some of her children were members of the Bethel Cumberland Presbyterian Church, which stood near her home at Sango. Mary died in 1870, at the age of 49, probably from consumption (tuberculosis), the same disease that killed her daughter two months earlier. Mary was married to George Coffee Halliburton on December 17, 1840 in Montgomery Co., Tennessee 1. For more information about their children, see his page. 1. Rutherford, William K. and Anna C. Genealogical History of the Halliburton Family. Privately Printed, 1972. 3. Cemetery index, Old Grants Chapel Cemetery, Montgomery Co., Tennessee. 9. Tombstone inscriptions, Old Grants Chapel Cemetery, Montgomery Co., Tennessee.